Congrats! :) Now you can plan the nursery! Each one is a miracle! 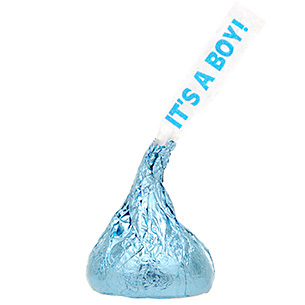 Congratulations on your sweet little man! Yay for boys! And yay for a healthy bean! Aw Congrats!!!!! So happy you all got to find out today! Congrats! Can't believe you're already finding out, seems like just yesterday you got your BFP! Congrats! Baby boys are super fun! The ultrasounds are the coolest things aren't they? Yeah, for whatever reason, I always saw all blue for your little bundle. Sooo excited to see the nursery play out now. Woo hoo!! Hey, guess what? You're a momma to a little boy! SO stinking thrilled for you!! As someone who grew up with brothers, you are in for a treat. There's just something so sweet in the way boys love their Mamas...this is just so exciting!!! BAHAHAHA! I LOVE the jazz hands! Love.it. Such great news that all is well too. Isn't it the most surreal thing ever when you see all that on the screen?? I honestly don't know how people can see an ultrasound and not believe in a Creator! The weiner stuff - HILARIOUS! Awwww Congrats girl! A BOY, YAY!!!!!! aww yay!!!!! Congrats girl!!! What an exciting day!! Very excited for you! Congratulations. Aw congratulations! I keep waivering between wanting a girl and wanting a boy. I guess that's good because I'll be happy either way! Yay for wieners! Congrats to you guys...I'm so excited for you! Congratulations! I'm due a week behind you, but we are not finding out the gender of our bean. A little boy is so exciting! Hope you are feeling well! So thrilled for you guys! What blessed news you have received Betty!! Congratulations! Congratulations!!! i am soo out of the loop!!!!!!!!! I am just over the moon excited for you!!!! Have you continued with acupuncture after your BFP? I'm doing acupuncture now and have heard that some continue with acu throughout 1st trimester. Thinking of doing so when the time comes.